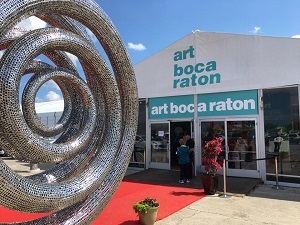 Art Synergy is inviting artists from Broward, Palm Beach, Martin and St. Lucie Counties to apply to the call for artists for Art Forms at Art Boca Raton. This will be the third year for this unique event and we are proud to once again be a part of it. The International Pavilion of the Palm Beaches will include a 65,000 sq. ft. /6100 sq. meter exhibition hall, a full service restaurant, sculpture garden and lecture hall facility. Ample parking and valet service will be available to fair attendees. 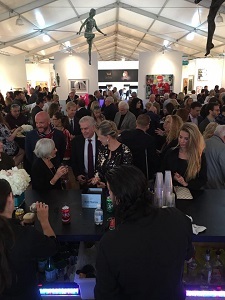 Art Synergy/Art Boca Raton 2018 Exhibition is open to all professional artists who reside and work in Broward, Palm Beach, Martin and St. Lucy Counties. All work to be exhibited must be well conceived, expertly executed, and arrive ready to hang. 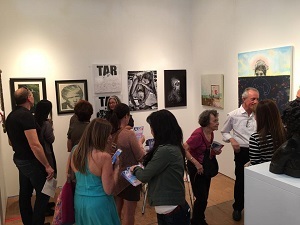 The images submitted must fully reflect the work to be exhibited in the booth. An artist who works in more than one media category, must submit an application in each category. If one application is accepted, only work in that category may be exhibited. If your work is accepted, there is a requirement to volunteer in the booth for at least 4 hours during the shows days. Also, accepted artists must provide a head shot. Jurors' selections are based on the level of technical skill, quality of workmanship, and originality of design as represented in the images submitted. A graduate from the University of Central Venezuela with a B.S. in Communications, Noor Blazekovic served for 10 years as a TV studio and field producer for Venevision TV Channel, Venezuela Latin America. She moved to the United States in 1998 expanding her production skills into the visual arts industry, having worked for Art Basel Miami Beach Show Management from 2002-2006; and in 2006 she founded Irreversible Magazine and Projects, developing an extensive international platform for nontraditional exhibitions and cultural exchanges. In addition, since 2008 Blazekovic is the Executive Director of GIANTS IN THE CITY, a monumental inflatable traveling public art exhibition where she oversees the projects and exhibitions related to the Arts in Public Places Program; confers with artists, and consults with Art Commissions, City and County departments, as well as community groups and developers regarding projects, art events and workshops. As the Magazine Publisher of Irreversible and Chief Editor, she manages the editorial and commercial success of an award-winning contemporary art publication; defining the editorial position and managing business operations to provide readers with high-quality content while maximizing revenue and profit for 10+ years. Blazekovic is a respected art curator and project developer within the South Florida art community and beyond, her projects have taken her worldwide where she has mentored numerous emerging and mid-career artists, helping them to develop their careers and strengthen their work while building a collector base and following. Blazekovic has received numerous awards within the industry for her leadership role and continued developments within the local community.